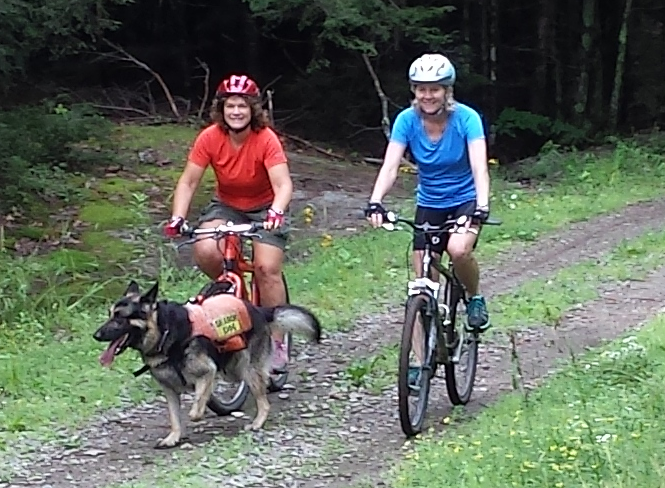 Elizabeth and Kobuk to the rescue! YORK — A 77-year-old South Portland woman who had been missing since Monday was found safe July 9 in the woods of Waterford by Kobuk, a 5-year-old German Shepherd search and rescue dog, and his owner, Elizabeth Fossett of York. Ruth Francis Brennan, who had been missing for 48 hours, was found by Kobuk and Fossett shortly before 9:30 a.m. Wednesday. The pair had been part of a search team of 146 people looking for Brennan, a power walker who was last seen walking away from her camp on Five Kezar Ponds. Searching in the still heat for two days, Fossett said she was thankful for a wind on Wednesday, as Kobuk is trained as an "air scent dog," she said. "All of a sudden, up goes his nose, off he goes on the scent," Fossett said Wednesday afternoon. "When he gave me a trained alert bark, as we came down over the area we came up to her, I yelled down, 'Are you Ruth?' She picked up her head and said, 'Yes, I am Ruth.' She was sitting on a log. When she picked up her head, it was just exhilarating." The fact that Brennan was sitting up, and that she picked up her head and spoke, were good signs for her health, Fossett said. Brennan was located in a heavily wooded area approximately 1.25 miles from where she was last seen. As Fossett called the Maine wardens to her location and gave Brennan water, she gave Kobuk his reward. "He lives to play ball," she said. "I have a ball with me. In all the training when he finds the person, when he shows me where they are, I give the ball to the person and they play ball with him." Every time Fossett threw the ball to Kobuk, the dog let it roll down to Brennan, she said. "It rolls down behind her," Fossett said. "Finally, he patiently waits. She turns sideways and says, 'Oh, isn't he the handsomest dog.' She picks it up and throws the ball for him. It was fantastic. She starts tossing the ball. It was celebration for the dog, but it was a celebration for me, as she was coming to it more." Brennan was brought out of the woods and taken to a hospital following a reunion with her family. Fossett got Kobuk from Brown Hill Shepherds in Weare, N.H., when he was a puppy and named him for a place in Alaska that means "big stick," she said. For the past two years, the pair have been part of the Maine Search and Rescue Dog team and have worked with the Maine Warden Service to find missing persons, she said. Fossett credits the team effort that included the warden service, state police, Oxford County Sheriff's Office deputies, Maine Association of Search and Rescue volunteers, Maine Search and Rescue canine teams, the Maine Forest Service, Midcoast Maine Equestrian horseback teams and Baxter State Park rangers. "We all do this for today," she said. "For the day we bring someone home to their family — alive, safe and a happy reunion." Information from the Bangor Daily News was used in this report.